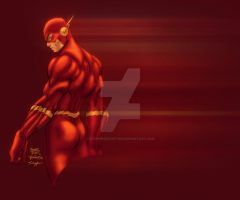 Logo of The Flash, the superhero of fast legs, done in PS CS5. The my logo used in your work. I use this in this > [link] Thank You! Thanks, I really liked what you did to embed my art. Thanks your logo is great! It was really cool, really enjoyed it. Glad you enjoyed it and have used in your work. I'll put your link in the description of my work, so the staff can also see what you did, okay? No really, thank you! You guys do all the work! All I do is try to piece things together in a way that people would want to look at it. You designers deserve most of the credit!!! Have a good one! Well I'm not a designer, but I was flattered by the compliment. ei qual teu msn ? Até agora é o melhor de todos!!!!!!!!!!!! O Flash é o meu segundo herói favorito! hahaha pelo que eu vi a séria já está quase finalizada né? serão qtos no total? ainda tem o lanterna verde, o marciano..